Following Dennis Kimetto’s superb perfomance at the 2014 Berlin marathon in which Kimetto not only broke the world record, but also became the first man to run under 2:03:00, Kenyans now own 11 out of the top 12 times ever run in the marathon. Though Kenya has always produced excellent distance runners since as far back as the 1950s, the marathon is the one event that Kenya had never done well. Before 2003, the world marathon record shuttled between nations like Great Britain, Australia, Japan and Portugal. Even Ethiopia produced two world record holders, the legendary Abebe Bikila in 1964 and Dinsamo Belayneh in 1988. Kenyan marathoners not only did not set any records during this period but were never even in contention to win City marathons or championship medals. In fact Ethiopia’s marathon pedigree was well above Kenya. In 1964, Abebe Bikila shocked the world by winning the Olympic gold while running barefoot. At the 1968 Olympics for example, Kenya performed very well on the track, winning 3 gold and 4 silver to finish third overall. In the marathon however, Kenya was abysmal. The best placed Kenyan was Nafatali Temu who finished 19th. Amazingly, he had already won gold in the 10,000m. Ethiopian Mamo Wolde won the marathon gold on that day. The 1972 Olympics were even worse as Richard Juma, the only Kenyan did not finish. The pattern continued at several Olympics, Commonwealth games and world championships. At the 1983 world championships, Kenya did not even bother to enter a runner, while Kebede Balcha of Ethiopia won the silver medal. Joseph Nzau gave Kenya its only decent performance of this period when he finished 7th at the 1984 Olympics. In fact even Tanzanian marathoners like Juma Ikangaa and Gidamis Shahanga did better than Kenya. For example, Ikangaa won the African championships marathon in 1982 and Commonwealth games silver in 1982. 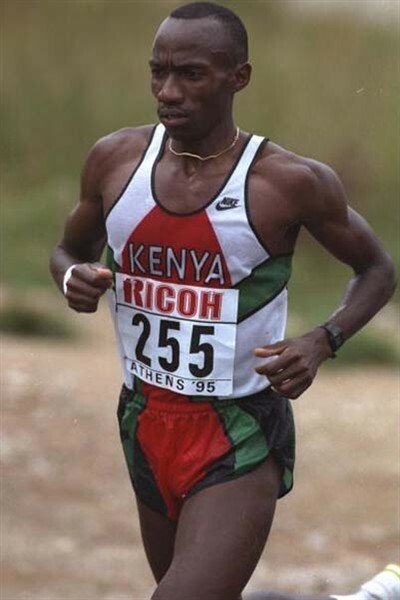 At the 1984 Olympics, he finished 18 seconds ahead of the top Kenyan Nzau. Douglas Wakihuri & Ibrahim Hussein Kenya’s marathon pioneers. 1987 was a watershed year for Kenyan marathoners Ibrahim Hussein became the first Kenyan to win a major city marathon when he won the New York marathon. That same year, Douglas Wakiihuri became the first Kenyan to win the marathon at a major championship when he won the gold medal at the 1987 World athletics championships. Prior to that, the Japan based Wakiihuri was a virtual unknown in Kenya and elsewhere. It was an amazing feat since this was his first major competition. From this point on, Kenyan runners established themselves at the top tier. Wakiihuri went on to win the silver medal at the 1988 Olympics and won the New York Marathon in 1990. Hussein won the Boston Marathon three times, starting a strong tradition of Kenyan runners in that City: In the last 23 years, the marathon has been won by a Kenyan 17 times ! Kenyan runners have been just as dominant in the London marathon, winning 8 of the last 10. Record wise, Paul Tergat became when the first Kenyan to break the world record in Berlin in 2003. He held the record until Haile Gebreselassie broke it in 2007. Patrick Makau reclaimed the record in 2011. This was then followed by Wilson Kipsang in 2013 and Dennis Kimetto in 2014. Though Kenyan runners dominated the event throughout the 1990s and the new millennium, they did not win the Olympic gold medal. And in the world championships, Kenya went 20 years without winning gold. The reason for this dry spell was because it was difficult to convince the top marathoners to run at the Olympics where there is no prize money. In the intervening period, Eric Wainaina won bronze medals at the 1996 and 2000 Olympics. That changed upon the realization that winning Olympic gold can actually enhance a runners profile and increase his appearance fees at major city marathons. Samuel Wanjiru became the first Kenyan to win the Olympic gold when he won in 2008 in Beijing. In the world championships, Kenya’s drought ended in 2007 when Luke Kibet won the gold medal in Tokyo. Following Kibet’s feat in 2007, Abel Kirui followed up with two successive gold medals at the 2009 and 2011 world championships. Why did Kenya suddenly become good at the marathon? The best runners have all migrated to the marathons and half marathons because road racing has become far more lucrative than track racing. Winning a major city marathon such as New York can get the winner $100,000 in prize money. There are also bonuses that come from shoe sponsors as well as bonuses for setting course records. And World Marathon Majors title comes with a prize of $500,000. Meanwhile on the track, opportunities to win have become fewer. The 10,000m race which used to feature at Grand Prix races in places like Brussels is no longer featured in the Diamond league series. 5000m races have become fewer and fewer. As such all the best distance runners have migrated to the road races. Even the top Ethiopian and North American runners are now mostly on the roads.Where runners used to aspire to run in the Olympics, they now aspire to be road runners. Kimetto for example has never run on the track. The fact that all the best distance runners are now on the roads largely explains why the marathon record is broken more often than it used to. This entry was posted in Kenya Sports news and commentary, Profiles and articles on Kenyan runners and tagged Abel Kirui, dennis kimetto, Eric Wainaina, Joseph nzau, Kenyan marathoners, Luke Kibet. Bookmark the permalink.